While the National Disaster Management Authority’s (NDMA) initial efforts to assess damage5 have been significant, relief activities are still lacking.6 The presence of poor infrastructure hindered efforts in the remote regions in particular. According to reports, there was also a lack of effective coordination due to an absence of clear standard operating procedures (SOPs) for disaster management.7 In particular, Chitral, had not received sufficient relief amenities.8 Where the Government’s efforts fell short, the Army and Frontier Corps,9 along with at least one non-governmental organization filled the gap10 with regards to recue and relief. Relief efforts often focus on providing goods to the affected at the cost of logistical management for the most badly affected and hard to reach areas. PILDAT believes that the continued difficulty in reaching the most remote earthquake-affected areas demonstrates a lack of preparedness on the part of the Federal and KP Governments, especially considering Pakistan’s high risk of earthquakes.14 The Governments should, therefore, focus on establishing effective SOPs. Another important fact is Pakistan’s recent announcement of its newly developed tactical nuclear weapons against India’s “cold-start” strategy.19 When viewed in the context of the Sharif-Obama summit, it is clear that Pakistan, while willing to avoid escalation, has highlighted the violence on the Line of Control to communicate to the US its robust nuclear response capability. Based on this, Pakistan’s stance is clear: it is willing to act against terrorist outfits but it will take all necessary steps to maintain its sovereignty. Lastly, Ms. Maryam Nawaz Sharif’s participation in the Pakistani delegation also signals an important development. According to reports, the First Lady of the United States specifically requested her presence,20 indicating what could be considered her formal introduction in politics. K-Electric’s performance has been problematic in recent months, the most egregious example of which was the organization’s failure to provide electricity during Karachi’s heat wave in June 2015.22 The Federal Government’s efforts to upgrade K-Electric’s system is, therefore, a much needed step in the right direction. Pakistan and Russia have struck a government-to-government deal regarding a North-South Liquefied Natural Gas (LNG) pipeline, which will transport 12.4 billion cubic meters of imported LNG from Karachi to Lahore. It will cost US $2.5 billion, with Russia providing 85% of the equity. The Russian State Corportaion will own and operate the pipeline for 25 years to recover its investment and then transfer it to a Pakistani entity. This deal signals a good development in Pakistan’s effort to diversify its friendly foreign relations, especially with regards to trade. Furthermore, as Russia is among the largest producers of natural gas, this project can potentially lead to deeper economic relations with Pakistan, with Russia exporting its gas to Pakistan. The Federal Government’s sensitivity to more job creation through a focus on increased trade within Pakistan is encouraging to note. However, the project’s effectiveness at delivering the benefits of this trade outside of Punjab remains unclear. The Federal Government should, at all times, be aware of the most important needs of all the Provinces and collaborate with Provincial Governments on projects to fulfill them. The Government should also make an effort to leverage its relationships with foreign institutions to develop deeper connections between them and Provincial Governments. Despite the comprehensive Muharram security arrangements cross Pakistan,24 attacks took place in Sindh and Balochistan. A suicide blast in Jacobabad, Sindh took 26 lives,25 after which the city’s security was handed over to the Army.26 Chief Minister Qaim Ali Shah announced compensation for victims and suspended two people, pending an inquiry into negligence. Investigations by the police’s Counter Terrorism Department have led to the collection of fingerprints for identification27 while two persons have been detained for interrogation on suspicion of involvement. While, the measures taken by the Federal and Provincial Governments demonstrate that peace during the month of Muharram was considered a high priority,24 the attacks are a clear indication of major gaps. The Provincial Governments of Sindh and Balochistan should be cognizant of troubled areas in their respective provinces and arrange for their security rather than only focusing on major cities. The Governments should also conduct an inquiry into the attacks in order to determine the exact nature of the lapses. Polio eradication is currently the top health priority for Pakistan. This development, therefore, is a cause for concern as the Federal Government is not effectively taking ownership of the plan, which makes the future of immunization uncertain. It is PILDAT’s view that this is a significant gap in governance. The Federal Government should take a more proactive role in approving the PC-1 so all Provincial Health Departments can negotiate terms with international donors for funding. The Federal Investigation Agency (FIA) arrested and established a case against Naved Alam Zuberi, a senior manager of Pakistan State Oil, after an internal audit report established evidence against him.31 These efforts by the Federal Government to curb corruption are encouraging. However, it is PILDAT’s reasoned opinion that the concerned agencies should also focus on corruption within the highest echelons of Governments, both Provincial and Federal. In a meeting of a delegation of PILDAT representatives with those of the Chief Secretary Office (CSO) of Khyber Pakhtunkhwa (KP), a detailed overview was provided of the CSO’s efforts in in developing a web portal. The launch of PMC portal, along with the earlier launch of the District Performance Management Cell portal, are clear indications of the KP Government’s drive to make its performance open to public scrutiny. These websites are also a very significant step towards the incorporation of technology for better governance and must be used as a model by all other Provincial Governments in Pakistan. 1. “Over 200 dead as 7.5 magnitude earthquake jolts Pakistan,” Agencies, Tariq Naqash, Syed Ali Shah, Imran Gabol, Irfan Haider, Ali Akbar, Fazal Khaliq. DAWN. Oct 27, 2015. http://www.dawn.com/news/1215519/over-200-dead-as-75-magnitude-earthquake-jolts-pakistan. Accessed on 27/10/2015. 3. 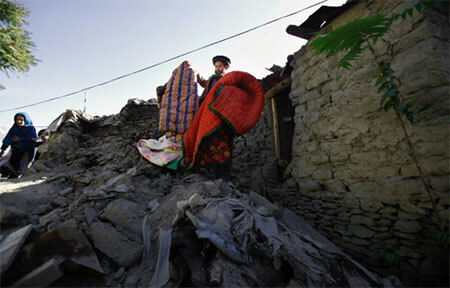 “Government won’t accept foreign aid for quake victims,” Ansar Abbasi. The News. Oct 28, 2015. http://www.thenews.com.pk/Todays-News-13-40428-Government-won%E2%80%99t-accept-foreign-aid-for-quake-victims. Accessed on 28/10/2015. 6. “NDMA Response to Earthquake,” National Disaster Management Authority. Oct 29, 2015. http://www.ndma.gov.pk/new/Documents/29-10-155.pdf. Accessed on 04/11/2015. 7. “Earthquake response,” Editorial. DAWN. Oct 28, 2015. http://www.dawn.com/news/1215843/earthquake-response. Accessed on 28/10/2015. 8. “Remembering the victims,” The News. Oct 30, 2015. http://www.thenews.com.pk/Todays-News-8-348408-Remembering-the-victims. Accessed on 02/11/2015. 9. “President briefed over relief activities for earthquake victims,” Daily Times. October 29,2015. http://www.dailytimes.com.pk/national/29-Oct-2015/president-briefed-over-relief-activities-for-earthquake-victims. Accessed on 16/11/2015. 10. “Post earthquake: ‘NGOs responding to situation’,” Express Tribune. October 31, 2015. http://tribune.com.pk/story/982403/post-earthquake-ngos-responding-to-situation/. Accessed on 16/11/2015. 14. “Pakistan in the most active quake zone, says US Geological Survey,” Anwar Iqbal. DAWN. Oct 27, 2015. http://www.dawn.com/news/1215636/pakistan-in-the-most-active-quake-zone-says-us-geological-survey. Accessed on 04/10/2015. 15. 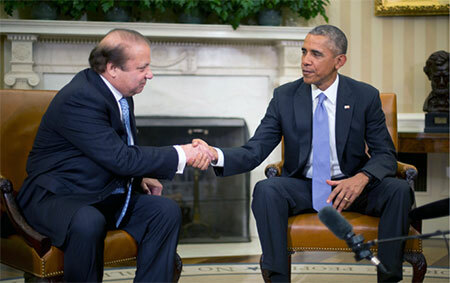 “Nawaz-Obama meeting: Agreement to act effectively against all terrorist groups,” Anwar Iqbal. DAWN. Oct 23, 2015. http://www.dawn.com/news/1215021/nawaz-obama-meeting-agreement-to-act-effectively-against-all-terrorist-groups. Accessed on 26/10/2015. 16. “Spending for education to be doubled by 2018,” DAWN. Oct 23, 2015. http://www.dawn.com/news/1215020/spending-for-education-to-be-doubled-by-2018. Accessed on 26/10/2015. 17. “India rejects Pakistan peace plan; calls for revival of terrorism talks,” DAWN. Oct 02, 2015. http://www.dawn.com/news/1210318/india-rejects-pakistan-peace-plan-calls-for-revival-of-terrorism-talks. Accessed on 05/11/2015. 18. “2015 Joint Statement By President Barack Obama And Prime Minister Nawaz Sharif,” Office of the Press Secretary. White House. Oct 22, 2015. https://www.whitehouse.gov/the-press-office/2015/10/22/2015-joint-statement-president-barack-obama-and-prime-minister-nawaz. Accessed on 04/11/2015. 19. “Pakistan has built low-yield nuclear weapons to counter Indian aggression,” Anwar Iqbal, AFP. DAWN. Oct 20, 2015. http://www.dawn.com/news/1214157. Accessed on 05/11/2015. 20. “Maryam Nawaz to back US initiative on girls’ education,” Aamir Illyas Rana. Express Tribune. Oct 20, 2015. http://tribune.com.pk/story/975933/maryam-nawaz-to-back-us-initiative-on-girls-education/. Accessed on 28/10/2015. 21. “K-Electric signs $250m accord for upgrading system,” DAWN. Oct 23, 2015. http://www.dawn.com/news/1215031/k-electric-signs-250m-accord-for-upgrading-system. Accessed on 24/10/2015. 22. “Federal govt, K-Electric directly responsible for heat wave deaths: Memon,” Sameer Mandhro. Jun 28, 2015. http://tribune.com.pk/story/911254/federal-govt-k-electric-directly-responsible-for-heatwave-deaths-memon/. Accessed on 29/10/2015. 23. “Loan accord of $178m signed with ADB for motorway project,” Amin Ahmed. Oct 23, 2015. http://www.dawn.com/news/1215022/loan-accord-of-178m-signed-with-adb-for-motorway-project. Accessed on 27/10/2015. 24. “Jacobabad blast case will be referred to military court, Qaim tells Shia leaders,” DAWN. Oct 26, 2015. http://www.dawn.com/news/1215370/jacobabad-blast-case-will-be-referred-to-military-court-qaim-tells-shia-leaders. Accessed on 27/10/2015. 25. “Suicide attack on Muharram procession claims 22 lives,” DAWN. Oct 24, 2015. http://www.dawn.com/news/1215218/suicide-attack-on-muharram-procession-claims-22-lives. Accessed on 27/10/2015. 26. “Investigators get Jacobabad suicide bomber’s fingerprints,” DAWN. Oct 26, 2015. http://www.dawn.com/news/1215399/investigators-get-jacobabad-suicide-bombers-fingerprints. Accessed on 27/10/2015. 27. “Poor security arrangements at Imambargah upset CM,” DAWN. Oct 23, 2015. http://www.dawn.com/news/1215030/poor-security-arrangements-at-imambargah-upset-cm. Accessed on 27/10/2015. 28. “Countrywide Ashura security plan in place,” DAWN. Oct 22, 2015. http://www.dawn.com/news/1214761/countrywide-ashura-security-plan-in-place. Accessed on 04/11/2015. 29. “Govt yet to approve three-year polio eradication plan,” Ikram Junaidi. DAWN. Oct 21, 2015. http://www.dawn.com/news/1214559/govt-yet-to-approve-three-year-polio-eradication-plan. Accessed on 27/10/2015. 30. “NAB, Rangers expand probe into energy sector,” DAWN. October 26, 2015. http://www.dawn.com/news/1215450/nab-rangers-expand-probe-into-energy-sector. Accessed on 27/11/2015. 31. “PSO official arrested for ‘misappropriating Rs6 million’,” Imran Ayub. DAWN. Oct 21, 2015. http://www.dawn.com/news/1214526/pso-official-arrested-for-misappropriating-rs6-million. Accessed on 27/10/2015. 32. Performance Management Cell Website. http://pmc.gkp.pk/. Accessed on15/10/ 2015. 33. “Mechanism unveiled to keep tabs on INGOs,” Iftikhar A. Khan. DAWN. Oct 02, 2015. http://www.dawn.com/news/1210341/mechanism-unveiled-to-keep-tabs-on-ingos. Accessed on 27/10/2015. 34. “Stampede at Hajj Kills More Than 700 People, Officials Say,” Louise Dewast, Justin Fishel, ELIZABETH Mclaughlin. ABC News. http://abcnews.go.com/International/stampede-hajj-kills-700-people/story?id=34004886. Accessed on 3/11/2015. 35. “Govt announces aid package as Mina death toll rises to 1,100,” Kalbe Ali. DAWN. Sep 29, 2015. http://www.dawn.com/news/1209678. Accessed on 28/10/2015. 36. “Fate of 28 Pakistanis killed in Mina stampede still unknown,” IftikharA.khan. DAWN. Oct. 14, 2015 http://www.dawn.com/news/1212945. Accessed on 27/10/2015. 37. “Opposition assails govt’s handling of Mina crisis,” Amir Wasim. Oct 09, 2015. DAWN. Http://www.dawn.com/news/1211818/opposition-assails-govts-handling-of-mina-crisis. Accessed on 28/10/2015. 38. “46 indicted in Model Town firing case,” DAWN. Oct 21, 2015. http://www.dawn.com/news/1214520/46-indicted-in-model-town-firing-case. Accessed on 27/10/2015. 39. “Shahbaz Sharif records statement in Model Town case,” Imran Gabol. DAWN. Mar 14, 2015. http://www.dawn.com/news/1169590. Accessed on 29/10/2015. 40. “Model Town incident: JIT ‘tightening noose’ around five cops,” Asif Chaudhry. DAWN. Jul 13, 2014. http://www.dawn.com/news/1118961. Accessed on 29/10/2015. 41. “ECP halts implementation of PM’s Kissan package,” Express Tribune. Sep 30, 2015. http://tribune.com.pk/story/965071/ecp-halts-pms-kissan-package/. Accessed on 12/10/2015. 42. “IHC restores PM’s relief package for farmers,” Malik Asad. DAWN. Oct 16, 2015. http://www.dawn.com/news/1213432/ihc-restores-pms-relief-package-for-farmers. Accessed on 27/10/2015. 43. “Turbines for Bhikki plant among best available, says Punjab govt official,” DAWN. Oct 24, 2015. http://www.dawn.com/news/1215163. Accessed on 1/12/2015. 44. “Turbines for Bhikki plant among best available, says Punjab govt official,” DAWN. Oct 24, 2015. http://www.dawn.com/news/1215163. Accessed on 1/12/2015. 45. “Yet-to-be-developed gas turbines being acquired for power plant,” Ahmad Fraz Khan. DAWN. Oct 20, 2015. http://www.dawn.com/news/1214194/yet-to-be-developed-gas-turbines-being-acquired-for-power-plant. Accessed on 26/10/2015. 46. “Turbines for Bhikki plant among best available, says Punjab govt official,” DAWN. Oct 24, 2015. http://www.dawn.com/news/1215163. Accessed on 1/12/2015. 47. The nationwide poll was conducted by PILDAT during June 02-12, 2015 following the completion of the second year of the National and Provincial Governments in office. The respondents for the survey included 3231 citizens from rural and urban areas from all the four Provinces of Pakistan, using Systematic Random Sampling Approach. Details are available at the end of the news release as well as the detailed report.